A tributary risk index used for assessment of optimal habitat at risk from anthropogenic stress was based on Wehrly et al. 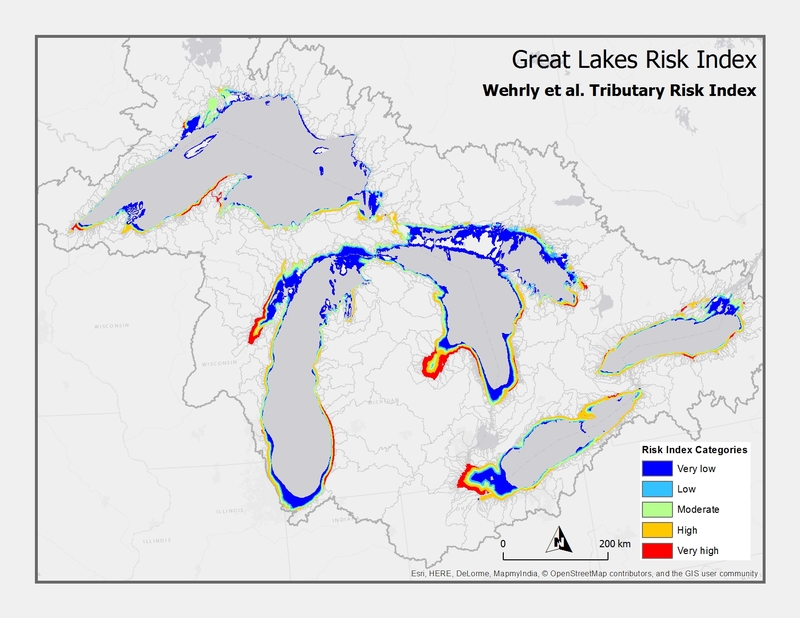 (2012) index which included watershed attributes for percentage of area used for agriculture, percentage urban, road density, population density, and dam density, updated with a new set of landscape data from GLAHF using consistently defined watersheds from the Great Lakes Hydrography Dataset. The index was distributed into the coastal margin by multiplying by the area of the watershed and then using pour point or shoreline segment distance-decay function weighted by depth. The tributary risk index was rescaled to the maximum value by lake, and five log breaks were set (1, 0.1, 0.001, 0.0001, and 0.00001) as subjective risk categories corresponding to very high, high, moderate, low and very low risk levels due to the distribution of the data.